Spring is here, and if you planning your prewedding photoshoot anytime soon, then let me tell you, this is the best season to go for it. There are many outdoor locations you can plan to have your photoshoot, with the spring bloom, it gives the perfect gorgeous backdrop as is but if you’re looking for some Colourful PreWedding Photoshoot Props, I have some options that you may like. Holi just went by, but that doesn’t mean you can’t have a holi prewedding photoshoot. Indian Weddings are all about colours, and what better way to start the festivities than playing some holi with the soon to be better half. The current rage this wedding season. Smoke sticks are everywhere, be it holi parties or a prewedding pool side function and of course as the newest prewedding prop. Smoke sticks are available on amazon, but you can also check with your local stationary store if they keep them. Go to a park, check with the gardener if he can switch on the sprinkler and have a blast for your prewedding photoshoot. Trust me, it will be the most fun you can have and candid too. I recently came across this prewedding photoshoot, and this picture was the cutest photo I have seen in a while. If you are someone who is not too fond of the holi colours for whatever reasons, then playing with flour is the new best fun option for your prewedding photoshoot. Guaranteed you and your hubby to be are going to have a ton of fun. I often see brides obsessed over what to do, what to wear, what props to use etc etc. But we sometimes just miss out the awesomeness that’s right in front of us, just like this beautiful season. Its the season of love, flowers blooming everywhere, the leaves looking their absolute best…its the best backdrop you can ask for. Bubbles are not just kids, revisit your childhood with your man with some bubble pictures. This prop is easy, inexpensive and are available everywhere. One of my favourite go to props is frames. They can be used in photo booth section, as prewedding props or even post wedding in your home decor. Its one of the most versatile props to make use of. Tip: Just visit any antique frame store near your house and ask if you can simply rent out some old rustic frames for a day. The whole transaction will be super cheap on the pocket, I promise. 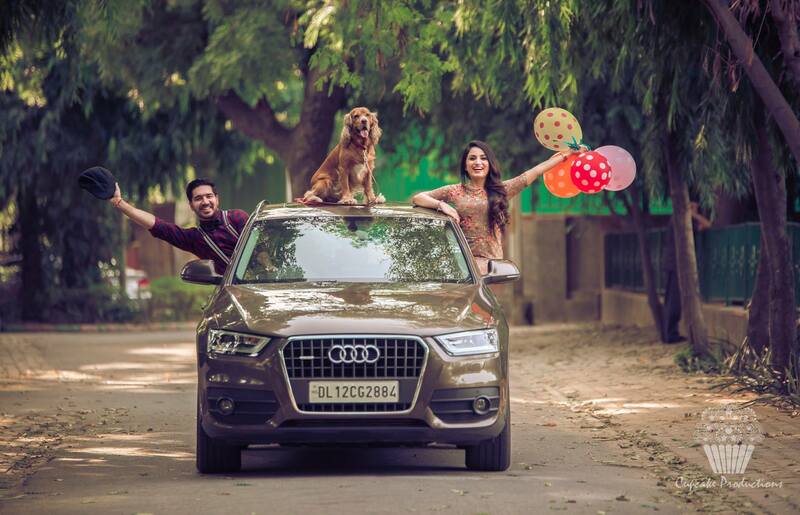 Isn’t this an adorable prewedding photoshoot. Love the paint colour and the ease in which this couple has candidly posed for the cameras. The thing about paper lanterns is that they look great be it for a day prewedding photoshoot or evening photoshoot.You can get away with a lot of different kind of clicks by using this one prop. It doesn’t have to be a coconut only, you can think of any object to use as a prewedding photoshoot prop. Think about something with which you have memories attached with your loved one, and just use that in your photoshoot. The cutest prop by far has to be bringing your pets in the frame. They instantly add volumes to the cuteness factor of any prewedding photoshoot. So if you have a pet of your own, you’re sorted. But if you don’t, try and see if you can get a friends pet and the friend to tag along for your photoshoot. I decided to post all the different kinds of poses you can do with an umbrella because then it becomes like a two in one. Prop+Pose tips. If you own a printed colourful embroidered umbrella, a prewedding photoshoot is the best place to make use of it. Like, who doesn’t like fairy lights. No one that I know of. You can make use of your diwali lights, or go to some fancy cafe in the evening which has a terrace amy be, or a garden side view with lights on. Just order lunch dinner and carry on with your prewedding photoshoot. Young love is best depicted by balloons. Either opt for colourful balloons if your background is of monotone shades, or in the picture above, if your background is colourful then opt for neutral shade balloons. This is a complete DIY option. If you have a creative streak in you, you can totally do this. All you need is a nylon string (available in local stores), some colour papers, scissors and tape. Use one weekend to make these strings, use it in any garden or a picturesque location, and after the photoshoot use the paper craft for your room decor. Nothing says romance like a fresh bouquet of flowers. Its romantic, classic and quite easy to work with in a prewedding photoshoot. I recently did a spring wedding look photoshoot, and that’s when this idea struck me. To use flower petals as a prewedding photoshoot prop. Its quite genius actually, if you look around petals are shredding everywhere. Just use it to your benefit and have a fantastic prewedding photoshoot. You can use confetti and glitter as one of the props for your photoshoot. Usually the blowing of confetti towards the camera is the best shot you can get. Make sure you have a couple of packets with you so that in case you goof up and don’t get the right shot, you can go again. I have seen quite a few pictures with sparklers in them. It doesn’t need to be Diwali to use these for your photoshoot. But its better if you stock up on these props during diwali to use them for your prewedding photoshoot. This is a super cute idea to go for. You can use this prop for save the date, to show off your wedding rings and even use it for hashtag shoutouts. Love love this prop idea.